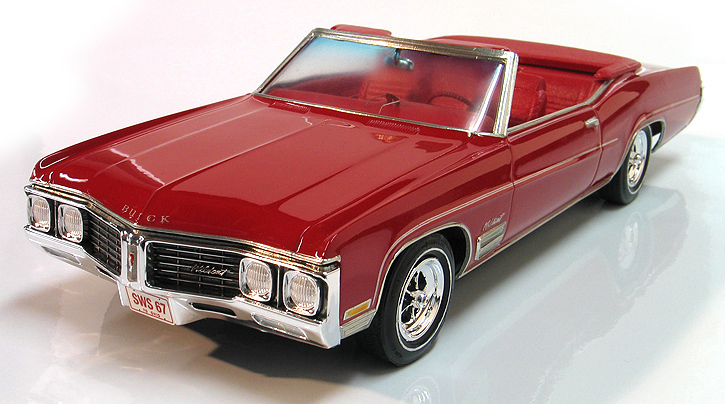 This convertible is my sixth 1970 Buick Wildcat model completed and marks the end of my series of Wildcat builds. When I first got the job to create the box art and decals for the Model King re-issue of this kit, I had no intention of building six of them. I built the first one as a stock hardtop to be photographed for the box and I figured that would be the end of it. After the kits went into production, I recieved a case of them and thought it might be fun to try and build the same kit in a bunch of different ways. My ideas were to build a demo derby car, a convertible, a low rider, a pro-touring custom and a pickup. Actually, this convertible was the first one I started on, but once I started the conversion work I got sidetracked by some of the other ones and the convertible got pushed aside. After I built several of the Buicks I kinda got bored by this one and forgot about it. The convertible was floating around half finished on my work bench and kept getting in the way for about a year, so I decided to finish it up. To convert my hardtop Wildcat into a convertible, I removed the top with a razor saw. 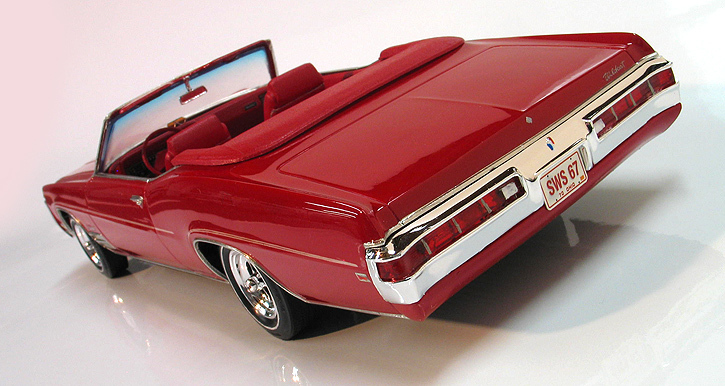 I then robbed a Model King re-issue of the MPC '70 Pontiac Bonneville convertible kit for it's convertible boot and it sunvisors. The Pontiac's convertible boot fits the Buick pretty well and only needed an few small adjustments. I then modified the Buick's interior by adding boot wells that mate to the convertible boot. For paint I sprayed the body and interior with Testor's GM flame red lacquer which is a very close match for the 1970 factory Buick color called Fire Red. After applying the white pinstripes supplied in the kit, the body was then shot with PPG urethane gloss clear. 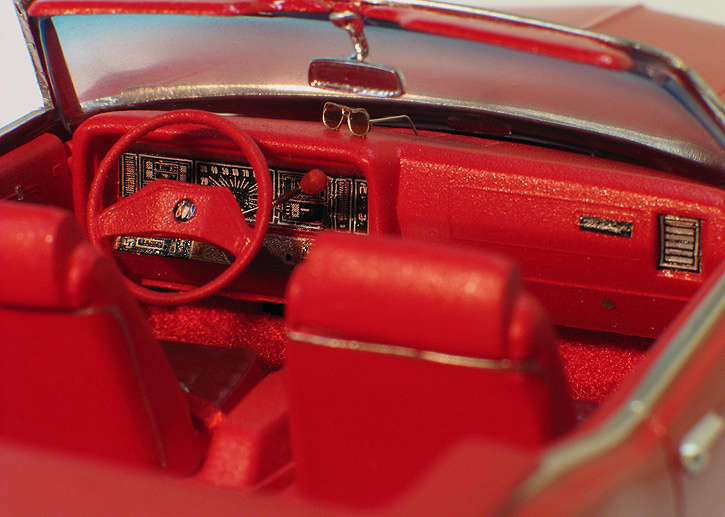 The interior parts were shot with various gloss and flat clear sprays shot at a distance to dust coat the parts and give them a leathery texture. 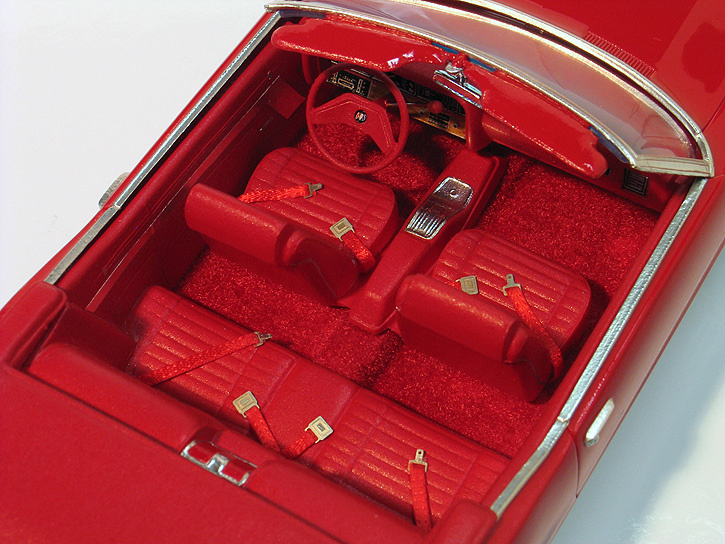 Since the interior was going to be fully visible in this car also I spent a little extra time detailing it with carpet flocking and photo-etched seat belts & sun glasses. I also made a column mounted shifter for the automatic transmission from a needle. Other details include white walls painted with a ruling pen and blue tinting airbrushed on the windshield. 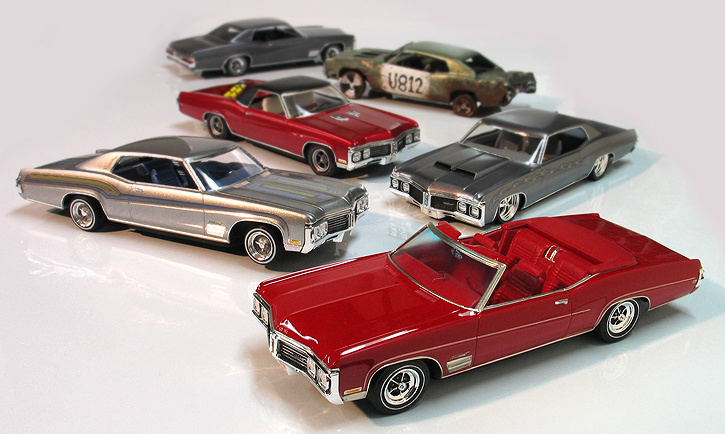 I had a lot of fun building these Buicks and while I was working on them came up with a few ideas for a couple more. I still have a few more unbuilt kits, so who knows... maybe I will build a couple more.